The Betrayal and Arrest of Jesus. 47 While he was still speaking, Judas, one of the Twelve, arrived, accompanied by a large crowd, with swords and clubs, who had come from the chief priests and the elders of the people. 58 His betrayer had arranged a sign with them, saying, “The man I shall kiss is the one; arrest him.” 49 Immediately he went over to Jesus and said, “Hail, Rabbi!” and he kissed him. 50 Jesus answered him, “Friend, do what you have come for.” Then stepping forward they laid hands on Jesus and arrested him. 51 And behold, one of those who accompanied Jesus put his hand to his sword, drew it, and struck the high priest’s servant, cutting off his ear. 52 Then Jesus said to him, “Put your sword back into its sheath, for all who take the sword will perish by the sword. 53 Do you think that I cannot call upon my Father and he will not provide me at this moment with more than twelve legions of angels? 54 But then how would the scriptures be fulfilled which say that it must come to pass in this way?” 55 At that hour Jesus said to the crowds, “Have you come out as against a robber, with swords and clubs to seize me? Day after day I sat teaching in the temple area, yet you did not arrest me. 56 But all this has come to pass that the writings of the prophets may be fulfilled.” Then all the disciples left him and fled. 23 “At the end of their reign, when sinners have reached their measure, there shall arise a king, impudent, and skilled in intrigue. 24 He shall be strong and powerful, bring about fearful ruin, and succeed in his undertaking. He shall destroy powerful peoples; 25 his cunning shall be against the holy ones, his treacherous conduct shall succeed. He shall be proud of heart and destroy many by stealth. But when he rises against the Prince of princes, he shall be broken without a hand being raised. 26 As for the vision of the evenings and the mornings, what was spoken is true. 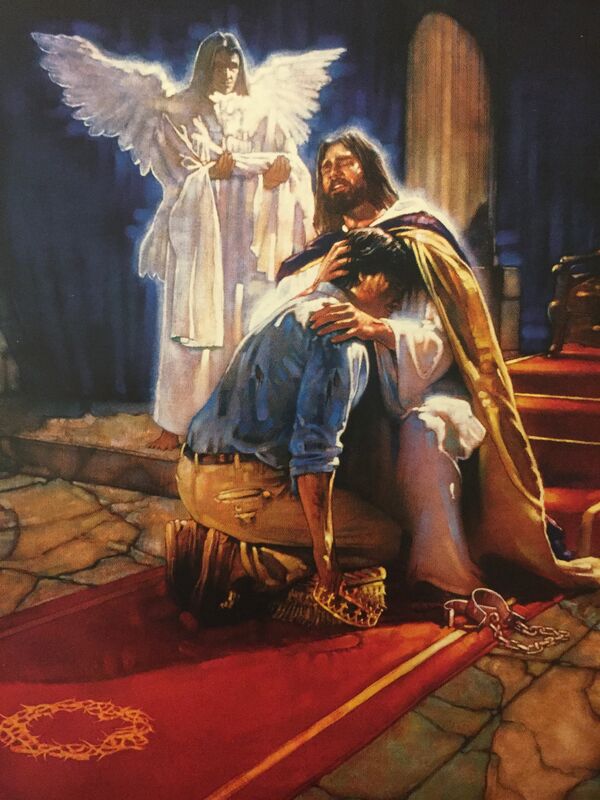 27 I, Daniel, was weak and ill for some days; then I arose and took care of the king’s affairs. But the vision left me desolate, without understanding. Dearest Jesus, I present to You the soul of my brother and sister, who has abandoned their soul to Satan. Take this soul and redeem it in Your Holy Eyes.Free this soul from slavery to the beast and bring it eternal salvation. Amen. Don’t waste good clean drinking water for cleaning, washing and flushing toilets. Be ready with other alternatives. A common cause of illness, and even death, is lack of sanitation. You won’t want to use your drinking water to keep things clean or to flush the toilet. To save washing things so often, stock up on paper plates, paper towels, and disposable cups. These can also be burnt/used as fuel. Keep some disinfecting cleaning wipes and sprays. Does your toilet still flush when the electricity is out? You may consider storing some water for flushing in the bathroom. At the first sign of a storm, you can fill the bathtub for this purpose. Another solution is to stock up on extremely heavy duty garbage bags and kitty litter. Place a bag either in your drained toilet or in a bucket. Sprinkle some kitty litter in the bottom of the bag. Each time someone uses the bathroom, add another handful of litter. Be very careful that the bag doesn’t get too heavy for you to handle it. Tie it up very securely and store it outside until services are restored. Nothing is more frightening than being completely in the dark during a stressful situation. Don’t forget matches, including waterproof matches and lighters. Your kit should include basic wound care items like bandages, antibiotic ointments, and sprays. Keep on hand a supply of basic over-the-counter medications, like pain relief capsules, cold medicine, cough syrup, anti-nausea pills, and allergy medication. and anti-diarrhoeal medications. Make a list of your family’s requirements. Do a quick inventory – to see what you already have . Organize your supplies so that they are easily accessible when you need them. The peace of mind that comes from being prepared for a disaster before it happens cannot be measured. You won’t have to fight the crowds or be faced with empty store shelves. You won’t have to sit there, cold and miserable, in the dark. You won’t be hungry or thirsty. It less traumatic for your children when they see that you aren’t afraid. Water for cooking, cleaning, and your pets, as well as water purification and filtration supplies. Waterproof containers for storing important documents. Extra Clothes, Pillows, Blankets: Stored in your emergency kit or a waterproof container. Entertainment items: Cards, board games, toys, drawing pads. Plastic Sheeting/Tarps: to cover any holes or damage to your roof. Plastic sheeting with a bit of duct tape is also great for patching leaks. Tools/Supplies for securing your home: a drill with screwdriver bits; roof and window repair tools, rope, leather gloves, shovel, bolts for doors. Keep non prescription drugs and other health supplies stocked. cough and cold medicines and face masks. I guess toilet paper would come under hygiene products, but I would add it explicitly to the list. And also, from my experience in the Bosnian war, where all society and services broke down, PLASTIC BAGS were found to be extremely important ,as there was no garbage collection, no working sewerage. Do you find you have those plastic shopping bags taking over your house (especially if you are recycling-minded)? A good tip is to stuff them into a “bean bag” ( – one of those large cloth bags that are stuffed with styrofoam beans and used as a comfortable pillow for lounging about.) A great solution is to stuff them into the bean bags – it will take hundreds, and the bean bag is still comfortable to lie/sit on. AND you will have the plastic bags when you need them! Transfer some of your wealth to bullion. Bullion, gold or silver, is an international trading currency that has value in the precious metal it is made of. Do NOT purchase certificates of gold or silver. Purchase physical bullion in coins or bars. No matter what happens with dollars, euros, yen and yuan, gold and silver will stand through the upcoming trials as an international currency. It is most likely that they will substantially increase in value. Silver in mid-2015 can be purchased at prices that barely cover the mining companies’ extraction costs. Do NOT purchase collector coins. Collector coins are sold at a premium price for their decorative value. Stick to bullion bars and coins. Since making change with silver or gold is not as simple as getting change with currencies, vary the size of the coins/bars you purchase. Start with one ounce bars or one ounce silver coins. As you accumulate more bullion, go 70% silver and 30% gold in varying sizes of silver bars and single gold ounces. There are many private dealers out there. Purchase within your country. Do not wait! If you cannot purchase much, purchase some. Do not wait until you have a specific amount, some months or years into the future before transferring wealth to bullion. Editor’s note: If you leave it too late, there could be a shortage and this will drive the prices up. You can buy silver and gold coins/ bars. The website shows $Aust. and $US. The news media runs out of adjectives and superlatives for every new extreme! The remainder of this document ( to be put in posts to come) is full of suggestions for living in a time when one cannot rely on utilities like electricity, natural gas, heating oil; and for a time when we can no longer depend on the world’s supply chain management, meaning going to the grocery store, restaurant, gas station or convenience stores whenever a person’s whims dictate. These are unique times that require discernment and preparation. They want you to have this document so you can be aware and reflect for yourself. IT IS FAR BETTER TO TAKE A RISK AND WARN YOU, THEN TO SAY NOTHING AND SEE YOU SUFFER BECAUSE YOU HAD NO FOREWARNING TO PREPARE. Whether you act on this advice or not … I would urge you to ENSURE YOU HAVE AT LEAST TWO WEEKS OF FOOD AND WATER IN YOUR HOME AT ALL TIMES. We need to Prepare for a darkness of evil that will overtake the earth on multiple fronts including: economic collapse, world war, global famine, apostasy, schism of the Catholic Church . God will reply with storms that will last weeks, earthquakes that will be felt across multiple countries, volcanoes shifting weather patterns and the occasional comet. The world has embarked on a path that has never been witnessed before. God always warns his people, such as in the prophets of the Old Testament. Today nothing has changed. He still warns His people through the various saints and appearances of Our Blessed Mother. We are entering the Great Tribulation spoken of in the Book of Revelation, the Book of Daniel and Matthew ch.24. Do what is appropriate for your situation, for where you live, for your family, for your needs. Do what you can within your means. DOING NOTHING IS NOT REALLY AN OPTION! Events in the world will affect everyone in some form or fashion. earthquakes can impact supply pipelines, and tornadoes can devastate crops; to name a few. No one will be left untouched; all will be impacted whether directly or indirectly. ENSURE YOU HAVE AT LEAST TWO WEEKS OF FOOD AND WATER IN YOUR HOME AT ALL TIMES. Calamities abound and will increase. Have 2 weeks of food and water at all times to weather such short-term inconveniences. All you need to do is rotate the food supply…consume the older stuff first and replenish with newer, keeping 2 weeks ahead. If you’ve never asked God for anything, now is a good time to start. Pray for guidance. No specific wording is needed, just talk to Him. Ask Him to show you what you need to do. There is a difference between being made aware and fear mongering. Fear mongering leaves you in a state of confusion, leaves you in a panic that all is lost. All is most definitely not lost! Actually this is a turning point in history. Evil’s last gasp before a time of peace. Only listen to those who guide reassuringly and advise calmly on how to move forward and prepare. While what is coming is out of the norm of what we have been used to, the events prophesied will happen to force people to choose good or evil – Heaven or hell one last definite time. This might be difficult – especially for those who refuse the chip (or the ‘mark of the beast’ as it is named in Scripture). If we are part of the remnant, we will be on the outer of society. We may not have access to our normal medications. Some things you can stock up on, but others you can’t get without a prescription, and (at least here in our country) you can’t fulfill prescriptions ahead of time and keep them in the cupboard. We have to start researching and planning now – to look for natural remedies or health store products that we can store. Please don’t hesitate to share any ideas/ expertise you may have. You can contact us via the contact form on the menu bar. Below is the advice from our “Raising Awareness” friend. Do you or a family member have specific ailments? Asthma, allergies, etc. Assess the needs of those in your family and do your best to have what is needed for as long as possible. Renew prescriptions as soon as refills are available. Ask your doctor for prescription to cover more days to minimize dispenser fees. Are you prone to illness? Do you need prescription medications? Is a member of the family prone to injuries? Consider what you have purchased medication for in the past 12 months. Are these illnesses that recur time after time, seasonally, or genetically? For this section, the needs will vary, yet the basics will be the same. method and tools to wash clothing. Ladies may need feminine hygiene products. If using an outhouse, toilet paper rolls can be placed in empty coffee tins to keep them dry and spider-free.